Scottish migrants were among the Mackay region’s first settlers. They were clannish, sociable, and had strong connections with the ‘Auld Country.’ As they established themselves, they encouraged their kin to join them and their numbers grew. By the beginning of the twentieth century, Scots formed one of the largest ethnic groups in the area and the Mackay Caledonian Society was an important social institution. In 1911 the Society established a pipe band led by Pipe Major John Campbell. For reasons now lost to history, bandsmen wore Mackenzie tartan. Initially, they went by the unwieldy title of the Mackay & District Caledonian Pipe Band and Concert Party, but sometime prior to World War I, the group adopted a shorter name – the Mackay & District Pipe Band. The First World War took a tremendous toll on Australia. From a population of less than five million, more than 416,000 volunteered to serve in the armed forces. Almost half of all eligible males enlisted, of whom 64% would be captured, wounded, or killed. The first Mackay & District Pipe Band was also a casualty. For eight years or so, the region remained without a pipe band. The idea of resurrecting it arose at the Caledonian Society’s annual St Andrew’s Day dinner in November 1926. Subsequently, an advertisement seeking interested persons was placed in the Daily Mercury. Pipe Major: Robert Allen, mill worker and former piper and bass-drummer with the Royal Scots. The new organisation was to be wholly independent from the Caledonian Society and after a long debate the meeting resolved it would be known by the earlier name of Mackay & District Pipe Band. Band-members set to work learning their craft. It was a challenge. The only experienced pipers were Robert Atkinson and Robert Allen; in the Drum Corps, the sole veteran was Frank Lithgow, a former bandsman with the Seaforth Highlanders; the remainder were raw recruits. Among the original members was a fourteen-year-old lad from Glasgow, who had come to Mackay with his parents a few years earlier – James ‘Jim’ Anderson would go on to become the Band’s longest serving member, marking up more than 70 years as both drummer and piper – an achievement unlikely to be equalled. The new Band salvaged equipment leftover from the earlier one – heavy and ill-fitting Mackenzie tartan kilts, pleated to the stripe after the military fashion; belts, buckles, sporrans; a bass drum and four half-sized side drums with drumheads of skin. Pipers used second- or third-hand instruments with cane reeds and leather pipe-bags, which were preserved by regularly drizzling mutton fat inside, rubbing the leather, and then draining the excess – imagine the smell! With scarcely fifteen months practice behind them, the new Band achieved its goal of marching in the Anzac Day parade of 1928. It was a remarkable feat given the Great Highland Bagpipe is a difficult and temperamental instrument at the best of times, and pipe bands cannot carry music so every piece must be committed to memory. On the morning of 25 April 1928, with more determination than experience, the Band set off from Robert Atkinson’s home in Gold Street, wheeled left into Shakespeare Street, and marched towards the town centre. The pipers knew only two tunes, Colonel Cruden and The March of the Cameron Men. They made such a mess of Cameron Men Pipe Major Robert Allen decided they should play only Colonel Cruden for the rest of the parade. Then, just as it seemed things could not get any worse, the young bass-drummer, Alan Calder, put his beater through his drumhead. Not being put off by disaster, they borrowed a bass from the brass band and soldiered on. The situation could only improve, and it did. Undaunted, the Band kept practising and within a few months could put on a much better show. Mackay grew and became more prominent in the 1930s despite the Great Depression. Hard times proved beneficial to the Band. It raised funds by playing at dances in small communities throughout the Pioneer Valley, south to Carmilla, north to Calen, and on street corners downtown most Saturday evenings (a tradition that continued until killed-off soon after the belated arrival of television in Mackay in 1967). In 1935, green tunics were purchased along with Mackenzie tartan plaids. The Mackay & District Pipe Band travelled thousands of miles by rail around Queensland, competing against others bands with mixed success. For ten years from 1932, Mackay was home to the Premier of Queensland, Scottish-born William Forgan Smith – a former Chief of the Mackay Caledonian Society. Like President Roosevelt in the USA, Forgan Smith believed in promoting capital-works projects to relieve unemployment and develop the economy, and his own electorate did not go wanting. The most significant event in the district during the second half of the 1930s was the building of the Mackay Outer Harbour and its infrastructure. The Band played at the laying of the harbour’s foundation stone in 1936, at the opening of the Forgan Bridge (named in memory of the Premier’s mother, Mary Forgan) in 1938, and again at the opening of the harbour in 1939. Then, as had happened a quarter-century earlier, the spectre of global conflict rose over the horizon. Unlike the First World War, World War II did not stop the Band. It continued with stalwart bandsmen either too young or too old to serve in the military and soldiers home on leave. Nine Mackay bandsmen (they were all men in those days) – Jim Anderson, Alan Calder, Donald Gunn, Jim Hastings, Bert Langley, Alec McKinnon, Angus McKinnon, Tom McKinnon and Bill Stewart – enlisted as a group and became members of the pipe band of the 2/31st Battalion AIF. They served as stretcher-bearers in the Owen Stanley Range Campaign, Papua New Guinea. No Mackay bandsmen were killed, but three received serious wounds: Bert Langley was shot through a major nerve and lost control of his foot; Tom McKinnon was shot in the chest; and Bill Stewart lost his leg and won the Military Medal. Playing with an army band had honed the returned soldiers’ musical skill and after war’s end, the Mackay & District Pipe Band benefited from their experience. The 1950s and ‘60s were a period of considerable success in piping competitions. In 1954, the Band replaced its Mackenzie kilts with those in Cameron of Erracht tartan purchased second-hand from the disbanded Queensland Cameron Highlanders (61st Battalion AIF). By the late 1960s, band-members were kitted-out in doublets, Argyll jackets, full piper plaids, Glengarry and Balmoral bonnets, hair and leather sporrans, and spats. Although the uniforms looked magnificent, they proved too warm for tropical Mackay and in 1973 the full-dress version was discarded in favour of cooler white shirts over Cameron kilts. Kilts suffer from wear and tartan fades. By 1979, there were few serviceable garments left from the war-surplus stocks bought from the Cameron Highlanders. The decision was taken to change tartan to Ancient Mackay – the same one the Band wears today. 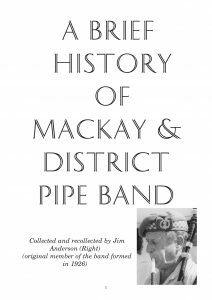 The Mackay & District Pipe Band gratefully acknowledges the contribution of the late Jim Anderson and his A Brief History of Mackay & District Pipe Band (1996) to this page. It remains a work-in-progress.